KIEV, Ukraine -- Travel portal Smarter Travel listed Ukraine as the first place you should go to while it's still cheap. 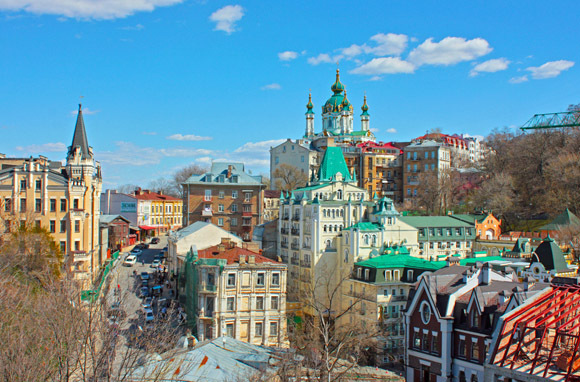 "Ukraine may be on the edge of discovery for visitors in search of rich history on a tight budget," states Smarter Travel staff writer Christine Sarkis. "Visitors return from the country amazed at its cultural wealth, the warmth of its people, and the fact that travelers can live large for under USD 50 a day," she explains. The travel portal describes Ukraine as "unspoiled by the tourist masses". "You can explore UNESCO World Heritage sites with locals and then tuck into a traditional meal for just a few dollars," suggests the author. World Heritage sites include Saint Sophia Cathedral and Kiev Pechersk Lavra in Kiev, Lviv historic centre, part of the Struve Geodetic Arc that embraces 10 countries, ancient beech forests of the Carpathians, and the Residence of Bukovinian and Dalmatian Metropolitans in the western Ukrainian city of Chernivtsi. "The world is bigger than our wallets are deep," reasonably notes Christine Sarkis, as she proceeds with the list. South Korea took the second spot on the affordability scale. Australian Tasmania followed by Nicaragua are third and fourth on the list, respectively. Magical Cambodia, exotic Sri Lanka, Ukraine's southern neighbor Turkey, tropic Panama, Gulf Coast of the U.S., and Central European Croatia conclude the list of 10 places you should go to while they're still cheap, according to Smarter Travel. Ukraine has intensified its tourism industry prior to the co-hosting of the European football championship EURO 2012. New stadiums, roads, railways, and airports, repaired hospitals and hotels emerged across the country, attracting tourists and investors. In 2012, Ukraine welcomed more than 940,000 tourists. The Eastern European country was also named one of the top 10 destinations for 2013 by six international tourism ratings - Globe Spots, National Geographic, Trip Advisor, and by three Lonely Planet ratings. Just in March 2013, Ukraine presented its tourist potential at one of the world's largest tourism summits ITB Berlin 2013, with German tour operator MediKur-Reisen signing a cooperation agreement regarding health tourism to southern Ukraine - the Crimean Peninsula.